Iron is an important trace mineral that is found in every cell of the body. It is essential for the formation of haemoglobin and myoglobin, which carry oxygen in the blood and muscles. A deficiency of iron in our blood results in ANAEMIA. The literal meaning of Anaemia is ‘No blood’. Those who suffer from it are tired, feel pale and lethargic. Realizing the importance of this mineral, and the role it plays in our body; I thought of coming up with a new title exclusively on “Iron Rich recipes”. 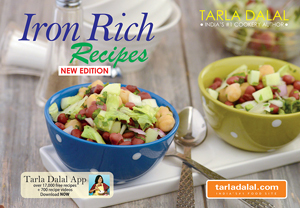 My qualified team of chefs and nutritionists has planned 39 sumptuous iron rich recipes after a thorough research. This book offers you with wide variety of vegetarian sources of iron and interesting recipes using them. Apart from 41 iron-rich recipes of Breakfasts, Soups, Rotis and Parathas, Subzis etc. the book also boasts of a section on International favourites. This book serves as complete guide for iron conscious as we have included information on the mineral iron, its sources, its requirement for different age groups and much more. You will also find a unique feature viz ‘simple pointers’ that guides you about correct eating pattern and simple ways to tackle anaemia. My efforts of putting all this together will be well worthy when you actually try these recipes and load up your iron stores.